The first issue of Without Borders, a bilingual magazine featuring stories about successful Lynners making a positive difference in the city, is making its debut at the Lynn Museum and Historical Society at 590 Washington St. on Thursday October 11, 2012, from 5-7 PM. Magazine founder and Lynn entrepreneur Juan Gonzalez says the first issue will be over 50 full-color pages and contain stories about businesses and leaders in our community. Subsequent issues will also include stories about philanthropic activities in the city. 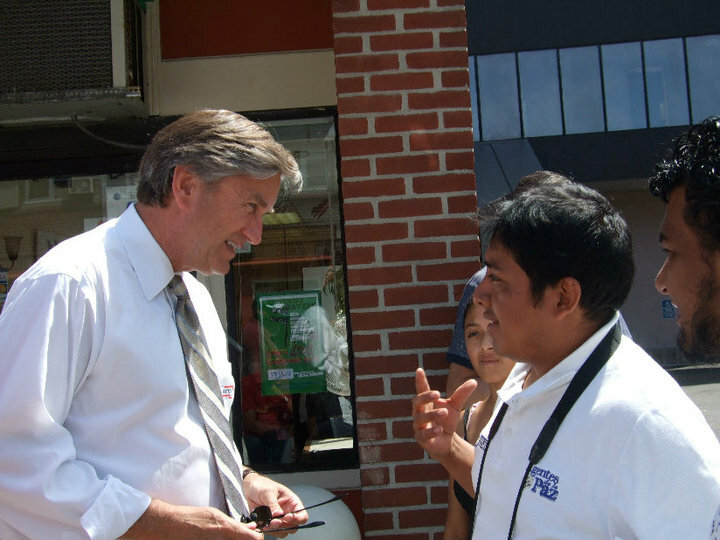 Juan Gonzalez (right) talks to Congressman John Tierney at Culturefest II. You may know the Guatemalan born Lynn resident Mr. Gonzalez as the founder and owner of Fernandos restaurant on Oxford St. He is now the manager at the Tacos Lupita restaurant across the street. Juan is an artist when it comes to food; how I wish Fernandos was still in existence! His past accomplishments include organizing two cultural festivals for Lynn and preparing food for Arts After Hours events and the Lynn Community Association’s first Clean Sweep city-wide clean-up. Now Juan is making his mark in publishing with a first of its kind bilingual magazine to help bridge the gap between different cultures and languages. I got a sneak peek at the first issue, and I am impressed by how professional it looks. So come on down to the Lynn Museum on Thursday, October 11, and be one of the first to see it. Son of Sol will provide Peruvian music, and Casa Antigua comes with delicious appetizers…..please save the date.